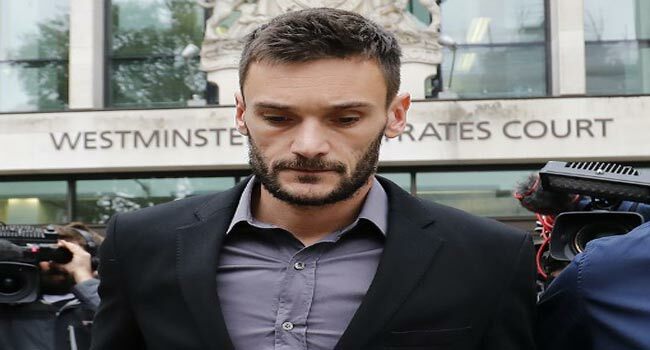 France’s World Cup-winning captain Hugo Lloris avoided jail but received a 20-month driving ban and a £50,000 ($65,000) fine on Wednesday for drink-driving in central London. The Tottenham Hotspur goalkeeper had earlier called his behavior “unacceptable” and received a lighter sentence from a judge who could have locked up the star for six months. “On 15th of July, he was the proudest man of the planet,” attorney David Sonn said in reference to the day Lloris and his France team lifted the World Cup trophy in Moscow. Lloris was one of the heroes of France’s commanding march to their second football World Cup in 20 years. The triumph turned the 31-year-old into a national hero and confirmed his status as one of the most respected goalkeepers in the world. But Lloris’s dream turned into a nightmare when his Porsche was pulled over for a routine stop in central London at 2:20 am on August 24. The Daily Mail tabloid said Lloris registered 100 microgrammes of alcohol per 100 milliliters of breath in a police check. The amount is roughly the equivalent of seven glasses of wine, although alcohol levels depend on multiple factors such as age, gender, and metabolism. The legal driving limit in England in a breathalyzer test is 35 microgrammes. “I wish to apologize wholeheartedly to my family, the club, my teammates, the manager and all of the supporters,” Lloris had earlier said in a statement. Police said Lloris nearly hit parked cars and went through a red light. They found vomit in the car after stopping him. Lloris spent seven hours in a cell that night before returning home on foot. His lawyer said Lloris knew he should not have been driving and had called a cab after a night out. The married father of two looked stoic and dressed impeccably in a dark suit and blue shirt as he made his way in silence through a crush of reporters into the courtroom. Lloris missed France’s opening games in the inaugural UEFA Nations League. France coach Didier Deschamps attributed his ‘keeper’s absence to a thigh injury and gave Lloris his wholehearted support. “He knows only too well that it shouldn’t happen, but it happened and it’s not going to change what I think about him and the Hugo Lloris that I’ve always known,” said Deschamps. Lloris was spectacular during the World Cup and gave up no goals in either France’s tough quarter-final match-up against Uruguay or their semi-final against a dangerous Belgium side. He blundered once in the final against Croatia but his team still prevailed 4-2. But Lloris’s London club are now left to ponder what to do with their starting keeper after his conviction for a serious driving offense. A team spokesman said before the sentencing that Tottenham was treating the entire matter “extremely seriously”.